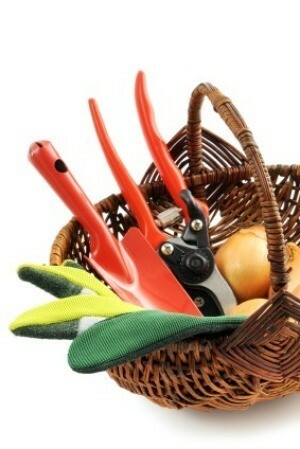 Garden tools can be quite costly to replace. Save money and ensure that your tools are always ready to use by taking care of them. 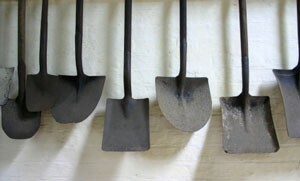 This is a guide about maintaining garden tools. Rub the handles of of pitchforks and shovels once in awhile with a rag dipped in linseed oil and you'll find the shafts both last longer and are much more pleasant to use. This year we decided to have a garden of our own. So my husband bought a new toy, a tiller. The problem is cleaning the tines when he's finished. I suggested he get a bathroom brush or dish brush at the dollar store and use it to scrub off most of the dirt before he uses the hose to clean it. This worked so well and also saved him time and water. It also saved his back from having to bend over so much. Here's a list of tips to help keep your garden tools in good condition. Clean your tools well after every use. Store your tools somewhere dry and off the ground. Keep a towel where you store your tools so you can dry them off before you store them. Before you put tools away for the winter put some linseed oil on wood handles and apply WD40 to the metal. Sand wood handles when they get rough to prevent splintering. Sharpen shovels with a file when they get dull. If you have a rusty tool the best bet is to remove the rust with a metal brush. If you have any more tips, feel free to add them below. Sink an old metal bucket into the soil and fill it with sand. Get some some old sump oil from your motor mechanic and pour it into the bucket saturating the sand. When you've finished each day in the garden dig into the oily sand with your spades and forks making sure each is well coated. It will prevent rust and rot where the wooden handle is joined to the garden tool. Source: My grandmother and she's been gone fifty years and I'm sure she wouldn't mind her big mouthed grand daughter giving out her tips. If I'm fortunate enough to win, I'd like it to go to one of your children's hospitals. Cheers !